Prototype developer Radical Entertainment isn't the only studio that got the axe from parent company Activision today. Sources close to and within developers Neversoft (Guitar Hero) and Luxoflux (Transformers: Revenge of the Fallen) are also being gutted. Luxoflux, also responsible for True Crime and Kung Fu Panda games for Activision, is said to have been shut down completely, according to former employees. Approximately 55 people have been let go, according to sources at the company, with some possibly being transferred to Call of Duty developer Treyarch. Activision is said to have laid off another 50 at developer Neversoft, formerly of the Tony Hawk Pro Skater series and responsible for the Guitar Hero series after the departure of Harmonix. 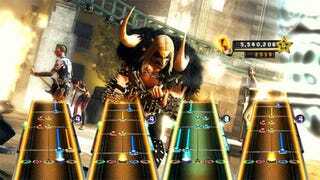 With Activision executives saying yesterday that the publisher planned to ship just ten Guitar Hero and DJ Hero products this year, down from 25 SKUs last year, those cuts make sense. You know, business-wise. When contacted, Activision provided the following statement. "Activision Publishing continually evaluates its resources to ensure that they are properly matched against its product slate and strategic goals. In 2010, the company's sku count will be smaller than in 2009 driven in part, by a decrease in the number of music-based games we will be releasing." "As we discussed on our earnings conference call yesterday, we are directing our resources against the largest and most profitable business segments, and as part of this initiative, we are realigning our resources to better reflect our slate and the market opportunities. At the same time, we are increasing our digital/online capabilities as we expect that digital/online will continue to become a more meaningful part of our business model in the years ahead."